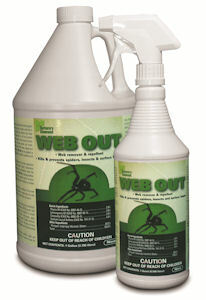 Web Out contains all-natural essential oils and vinegar, and is an EPA 25(b) exempt minimum-risk pesticide. It functions as a contact pesticide to kill spiders and other general pests, but it offers even more: When sprayed on webs, Web Out breaks them down for easier cleaning, and then prevents new webs from being built. Web Out lasts up to four months indoors and 60 days outdoors, depending on weather exposure. It can be applied around people and pets, and can even be used over water on boats and at marinas.